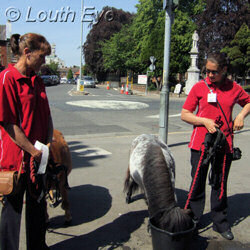 New maps of Louth have been set up around the town centre. So far I've spotted one outside Natwest, one in New Street, and another in Queen Street. I don't know how much money the operators, Cityscape Maps Ltd, will make on these maps when so many people have internet access via their phones. But I still see them as a Good Thing. 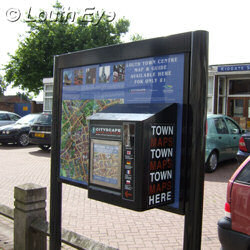 They look smart and they're another feature that makes the town welcoming for tourists. Lately HSBC in the Cornmarket has looked a bit like a building site. But what's emerging from the rubble is the shape of things to come. There are a lot more banking machines, whilst counter service is tucked away in the corner, pretty much out of sight. Face to face service is in decline everywhere, from the library to the supermarkets, and this is one more instance of the march of progress. The Phoenix Children's Foundation are a charity helping disabled children by running things like Riding for the Disabled. 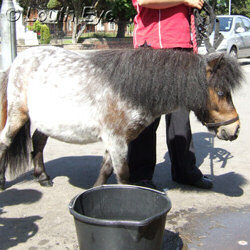 They have a number of petting ponies that they take round to places like schools. Two of their Shetland Ponies were outside Morrisons on Tuesday, raising money and awareness of the charity's work. 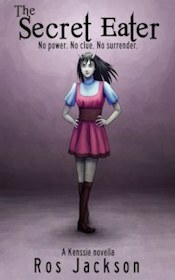 And looking very, very cute. Jane Rylands-Bolton is running a new Slimming World group on Thursday evenings at 7.30pm at the Salvation Army Hall on Church Street. If you need some help to shift the pounds that exercise alone won't budge ready for Louth Run For Life on the 26th of June, it's a great time to go along and try it out. The town council stand up for the rights of local people to have a say in the future of their cattle market. Going bananas (and zebras, firemen, jesters and other carnival outfits) in aid of Cancer Research. Former district councillor Lesley Koumi talks about braving cholera, knife-edge cliffs and Hilary Benn in her quest to make a difference. Craftwork goes on display to raise money for lifesaving charities.